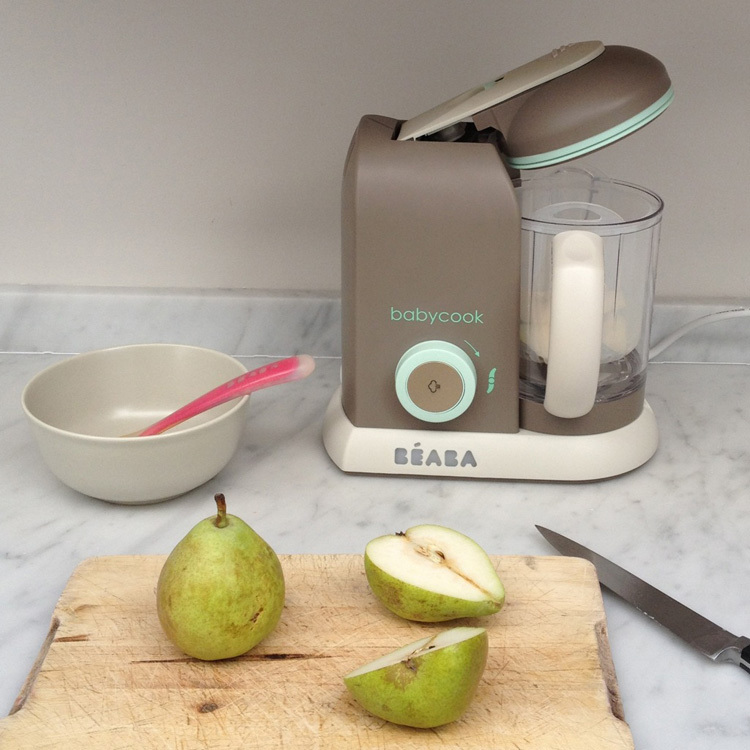 We are big fans of the Beaba Babycook! In fact, I gave ours away a couple years ago, thinking I wasn’t going to have any more babies (whoops!) … but now that Marlow is eating solids and I’m making food for her, I just had to get a new one. It saves time, eliminates mess, and makes the whole weaning process so much easier. The Babycook is a 4-in-1 product that steam cooks, blends, defrosts and reheats. In the initial weaning stages you can steam veggies (carrots, potatoes, sweet potatoes broccoli, courgettes, etc.) and fruits (apples, pears, and anything else that needs to be steamed before blending) and then easily blend it all in the same contraption. You can also use it to make little smoothies from fruits and veggies like strawberries, blueberries, mango, banana, spinach, etc. Now that Marlow is eating fish and chicken, I’ve also been adding that to steamed veggies and blending it all up for protein meals. Easy peasy. The Babycook is available from VUP Baby, along with other great Beaba products (I love their spoons and storage pots!) And when you’re finished weaning, it’s wise not to give it away (!!) because you can also use it as a little mini-prep for sauces, or smaller smoothies, etc. p.s. The VUP Baby sale is now on! With up to 60% off! So definitely pop over to browse their sale section. I also love the Babycook. I still have one of the first models (the green one). I love the sleek new look of the new one! I make smoothies sometimes in it too… And the Beaba spoons are my favourite!